The U.S. Bureau of Labor Statistics reported that the unemployment rate has decreased to 7.8%. However, September saw manufacturing employment edge down in by 16,000 on net, while manufacturing employment has been unchanged since April. At the same time, the latest ISM Report On Business stated that economic activity in the manufacturing sector expanded in September following three consecutive months of slight contraction, and that business has picked up for plastics and rubber products. The future of the U.S. manufacturing sector is a hot political topic as this year’s presidential election has made the issue of shipping U.S. manufacturing jobs overseas a central focus. While the country is in the midst of election season, several senators have made it a priority to visit their local plastic machinery firms in recent months. 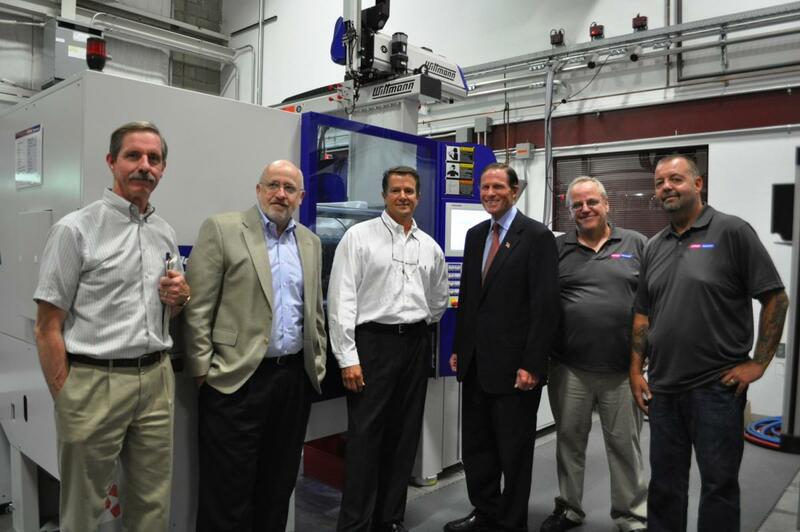 Plastics auxiliary, robots and injection molding machinery manufacturer Wittmann Battenfeld recently hosted Richard Blumenthal (D-CT) at its U.S. headquarters in Torrington, CT.
Wittmann Battenfeld President David Preusse told PlasticsToday the visit came after the company held a job fair to recruit 14 more positions to keep up with its growth. The company is currently tracking a 30% increase in new bookings over last year. There has been extremely strong second quarter and beginning of third quarter growth in robot sales, but the largest growth has come on post-NPE show with molding machines, integrated IMM, robot and auxiliary packages, and central material handling systems. Projected North American sales for 2012 are $80 million. Sen. Blumenthal’s office contacted Wittmann Battenfeld to get around the state and build an understanding of what is going on, Preusse said. At the tour, he was given a detailed overview of Wittmann Battenfeld’s operations and briefed on their consistent job growth as a Connecticut manufacturer. Blumenthal collaborated with Wittmann Battenfeld on potential ways in which his office could further assist their growth, including plant expansion, a new CRM system, a VOIP phone system, and improvement of their national service network. “The senator did ask how he could help us,” Preusse said. “He said in his travels he recognized most technical manufacturing companies, as Wittmann Battenfeld, have some challenges recruiting technical skilled workers, and he hopes the state can support that endeavor in the education sectors.” “Colleges are producing a zillion kids with degrees and huge college debts, and now are seeing opportunities in manufacturing and technical sales jobs that they had not considered when leaving high school,” Preusse continued. Over in Worcester, MA, Sen. Scott Brown (R-MA) visited the headquarters of Absolute Machinery, Absolute HAITIAN and Absolute Green Energy. Absolute Machinery President Nate Smith said that the senator was looking for a success story and that the company was chosen from more than 500 different companies in the area as the site for a visit. Brown toured the company’s two manufacturing and warehouse facilities prior to speaking to company associates and invited guests.